Home » Blog » Should You Schedule Maintenance Service This Spring? 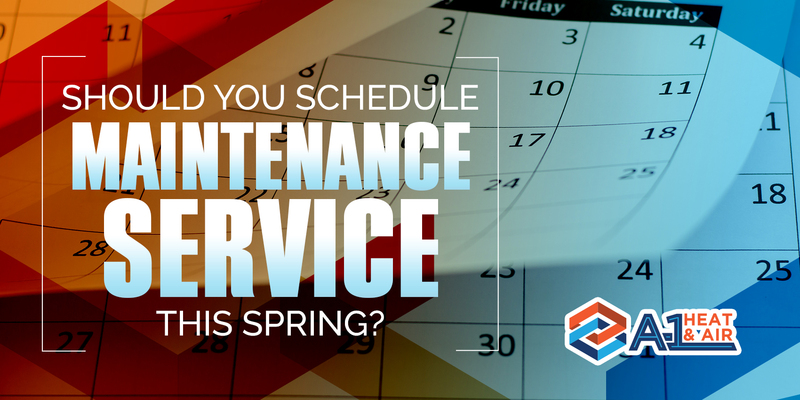 Should You Schedule Maintenance Service This Spring? The simplest answer to that is yes! Winter is winding down and you will be switching from heat to air very soon. Have you scheduled HVAC maintenance yet? Here are some good reasons why you need to have it done in the spring season. Replace worn out parts ahead of time. No matter how expensive and durable the parts of your heating and cooling units are, time will come that these will wear and become less efficient. Spring maintenance will notify you if there are worn out parts so that you can provide replacements before the scorching heat of summer starts. Extend your unit’s life span. Your HVAC system needs annual maintenance to keep them ready for extreme temperatures. Spring maintenance ensures that the components of your unit are properly cleaned and lubricated to prevent unnecessary breakdowns when you start to use it full time. Poorly maintained units are prone to system malfunctions and costly repairs, which are mostly the cause of early unit retirement. Improve indoor air quality. Winter gives your home a stuffy environment. Spring calls for more open windows and doors that can help lighten up your indoor atmosphere but it can also let in allergy –causing particles like pollens. Spring HVAC maintenance however, can help keep your indoor air healthy by taking care of dirty filters, removing dust build up, and cleaning air ducts to ensure that you will be breathing healthy air inside your home. Avoid the rush. Peak temperatures such as winter and summer also mean peak season for HVAC contractors. It will not be easy to set an appointment during these times of the year. You probably will have to wait a while before an HVAC technician comes knocking at your door and have your unit checked. The technician’s cost can be a bit higher too. To avoid the rush and to save on the service expenses, it is a good idea to schedule annual maintenance during the spring. Identify problems ahead of time. No one wants to experience a malfunctioning HVAC system in the middle of the summer heat. That is why it is important to identify the potential causes of system breakdown before you start to use the system continuously. Spring maintenance performs an overall diagnosis of your unit to ensure that problems are fixed and the system is ready and in good condition when you need it the most. Do not delay your annual maintenance any longer. Call your trusted heating and cooling technicians and have your units checked as early as today. Schedule your annual spring tune-up to prepare your unit and to ensure that every component is in shipshape before the temperatures soar.